Leave nature as natural as possible – this is the motto of Schoenenberger plant juices. The products contain the juice from freshly harvested plants, the majority of which are certified organic. 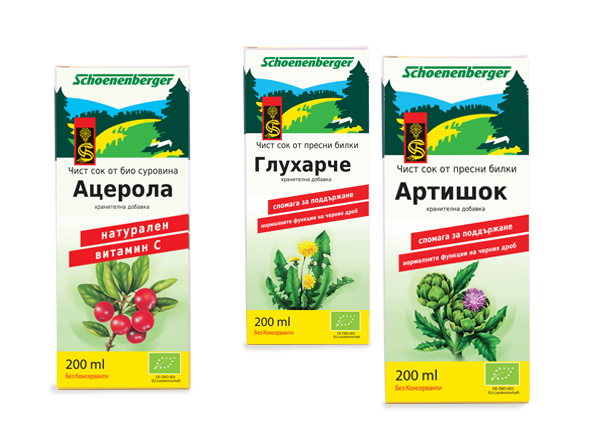 The advantage of the Schoenenberger fresh plant juices compared to other forms of herbal preparations is that they contain the whole complex of active ingredients because the pressing process doesn’t affect the structure of the plant components. The active ingredients are already assimilated in liquid form, so all the goodness of nature that is captured in Salus fresh plant juices is absorbed very efficiently by the body.